If your dog suffers from anxiety this is a great option. 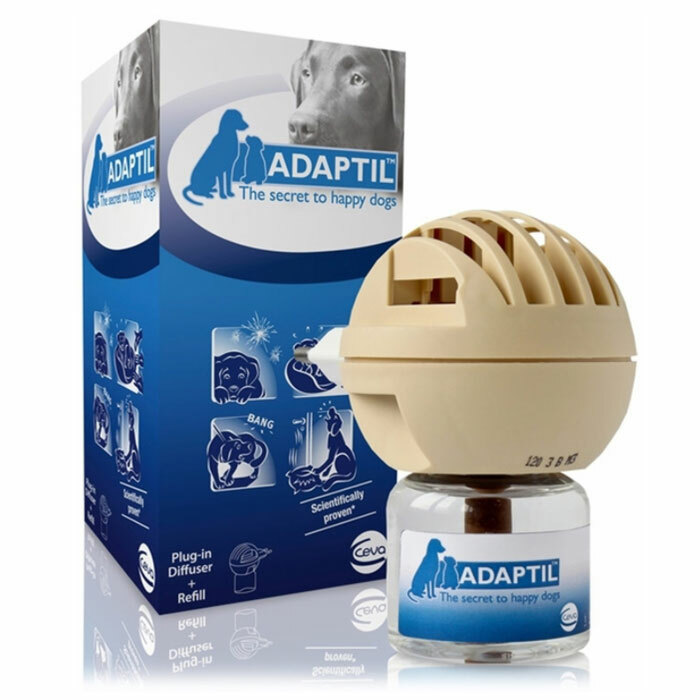 Just plug the Adaptil Diffuser discreetly into your wall and your dog should begin to feel more calm within 24 hours. Adaptil is not a medication. It’s a synthetic copy of the natural comforting pheromone produced by mother dogs to comfort and calm her pups. Dogs of all ages respond well to this comforting pheromone. Adaptil has been shown to alleviate canine anxiety in more than 16 studies in published scientific journals and has been presented at veterinary conferences worldwide. Many dog rescue organisations use Adaptil to alleviate stress for dogs during their stay. Adaptil is definitely worth a try as it comes with a 100% Guarantee. Give the diffuser a go for a month and if you don’t see results you are eligible for a full refund. *Adaptil is not recommended for use in cases of hyperactivity. When you plug in the Adaptil Diffuser and it should be working fully within 24 hours. Effects on dogs vary according to the type of issue and extent of the anxiety. It’s advised to give Adaptil at least a month’s trial to determine if it is a good solution for your dog. Screw refill vial onto diffuser unit. Refills should last approximately 4 weeks. The diffuser covers an area of 50-70m2. Plug the diffuser into an area where the dog spends a lot of time. Adaptil Refills can be purchased and replaced as required. The Diffuser unit should be replaced after 5 refills are used.